Companies across all industries implemented the principles of Lean Thinking in order to generate competitive advantage. Now, a plateau regarding the impact has been reached. Today, significant improvements can be made by using digital technology to achieve operational excellence. The available amount of data that is generated every day can be processed and analysed due to steadily increasing computational power. Additionally, the usage of technologies such as additive layer manufacturing, augmented reality or the cooperation of humans and robots has reached maturity. Mutually, Lean and Industry 4.0 solutions can help companies to reduce “wastes” according to Lean Thinking: e. g. unnecessary transportation, over-production, inventory levels, waiting times or also defects. First publications indicate that the resulting improvements due to Industry 4.0 are expected to cover a range of approximately 20% to 50+% waste reduction in the future. The recommended approach is to establish a solid Lean foundation first, and then to support the value adding processes by digital technology. 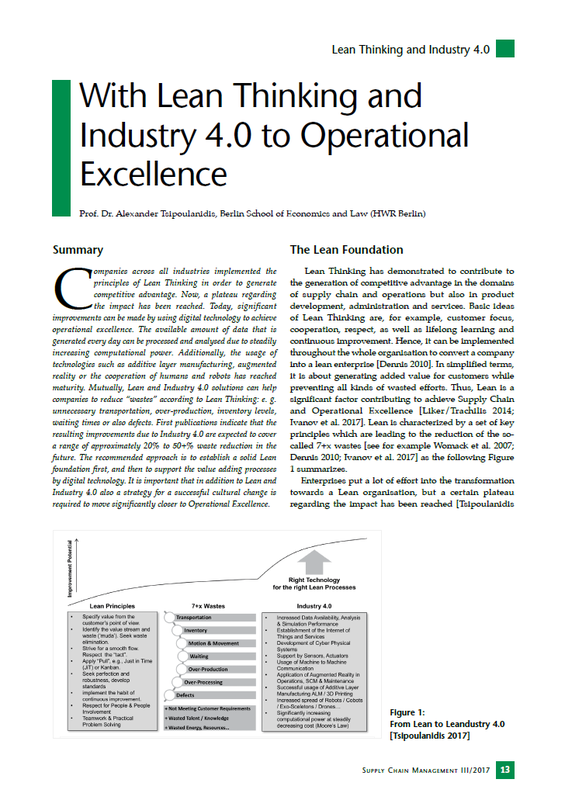 It is important that in addition to Lean and Industry 4.0 also a strategy for a successful cultural change is required to move significantly closer to Operational Excellence.